This article is a condensation of a presentation given with the same title at the 4th Annual Rocky Mountain Faceting Symposium, held May 11, 1995 in Albuquerque, New Mexico. There have been many requests to have this information made more widely available. You have my apologies (and those of the editor) for the delay in getting it done. First, it is not the intent of this work to drive the art and science of gemcutting down to the level of nit-picky trivia. The goal is to provide gemcutters with some basic real-life surface quality data that may help identify polishing parameters that result in quality polished stones. The use of instruments to quantify (in some sense) surface quality removes personal bias and permits gemcutters to perform independent analysis grounded in their own experience. In the following pages, you will find photographs of polished gemstone surfaces (reproduced as best we could from the color slides used in our slide presentation) taken with a special microscope, along with a table containing an entry for each photograph. The table includes the species of gemstone, polishing history if available, visual observations, and a set of roughness measurements taken using an instrument designed to measure the quality of precision optical components. Study the photographs and the table, and you can discover many aspects that contribute to the quality of the surfaces. Put your new knowledge to use! All measurements were made on the gem table facets only. Each gem was cleaned with optical grade ethanol and Kodak lens tissue (drag wiped) before measurement. The roughness measurements were made on a WYKO NCP-1000 optical profiler (phase measuring micro interferometer) in absolute roughness mode, 16 averages per point, with a 20X microscope objective. Three measurements were made on each stone, covering six sites (two sites are required for each roughness number, due to the requirements of the statistical analysis technique used). Roughness units are in RMS (Root-Mean-Square) Angstroms (A); for comparison, one A is about the diameter of an atom. 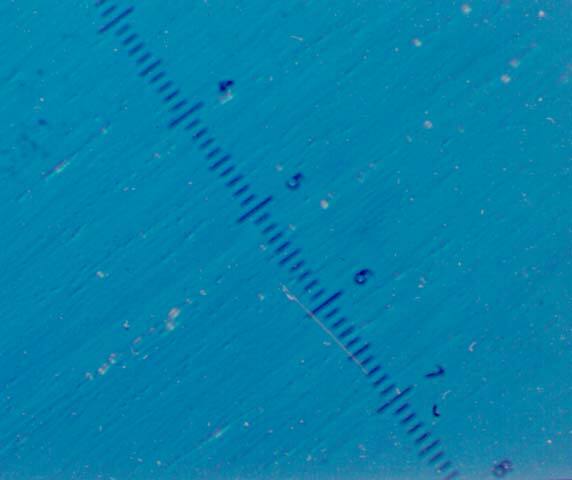 10,000 A equals one micron lam, and 25.4 1.un equals 0.001 inch, or about the diameter of a human hair. RMS is similar to the average deviation from a plane. The microscopy was done on a Nikon Optiphot Phase Contrast (Nomarski) microscope. This microscopy differs from conventional microscopy in that it essentially looks at the slope of the surface. A Nomarski microscope is a phase contrast microscope with special prisms and very high quality optics that actually encode the slope information in color, making it easier to interpret by eye. The slides were taken using Kodak Ektachrome (E-6), 200 ASA. Typical exposure times were two to five seconds. Magnification was 50X, unless noted otherwise. In many cases, it was necessary to find a pit or scratch and keep it in the field of view in order to focus the image; this happens when the surface is so featureless that there is almost nothing on which to focus! The slides were digitized for this article using a CCD camera and a home-made light table, followed by image processing and cleanup using Khoros (data processing software developed at the University of New Mexico) to bring out as much detail as possible. Much of the information was conveyed in the presentation by the subtle coloring present in the slides. The gray-scale representation loses much of that information. 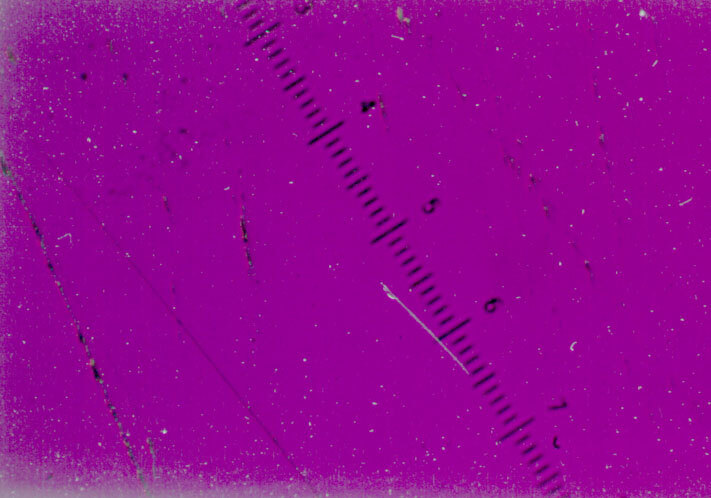 Some imaging artifacts may be seen: 1) the small black dots that always appear in the same place from photo to photo are dust particles within the microscope, 2) very faint diagonal lines may be seen looking like television interference; these are clocking errors in the CCD camera that have been made visible by image processing, 3) graininess and quantization errors may be seen occasionally, again due to image processing work. Other polishing combinations were found to produce lesser quality surfaces, and, in all cases, looked polished to the unaided eye, which is generally of most importance. However, it was often found that the surfaces were not completely polished. Many times, surface damage was visible that was probably introduced sometime in the grinding process. It other cases, the final polishing step was found to produce brittle-mode scratches on the surface. Some stones were found to have not been polished at all, but were only micro-ground. It is interesting to plot roughness data as a function of various parameters. Figure 1 shows the RMS roughness of the various stones plotted in the order that they were measured. The roughness ranges from around 5 A to about 90 A. The three measurements taken of each stone are plotted. Some showed very tight grouping, indicating that the surface was very consistent and uniform, while others exhibited significant variations, usually indicating that pits were present from grinding damage. Figure 2 shows the roughness data plotted as a function of the hardness of the stone. One might expect to see some sort of trend here, with the harder stones being more difficult to polish. Such a trend is not exhibited by the data. In fact, there appears to be almost no trend in this plot. Quartz stones appear generally to polish no better (and no worse) than harder materials. The anomaly seen in this graph is that the beryls seem to have a much better polish than the other materials. My conjecture is that the beryl minerals are sufficiently expensive that gemcutters: a) do not work with beryls until they are confident enough in their skills to take the risk, and b) invest time and effort in their work that is approximately related to the cost of the rough. It is also interesting to note that amateur gemcutters are capable of producing polished surfaces that easily compete with or surpass the surface quality of the commercial and professionally cut stones characterized in this study. This may be attributed to the dedication of the amateur cutter and the associated willingness to invest time that would be an economic disaster for someone needing to make a living from gemcutting. Thanks to the following gem cutters for the loan of gemstones for measurement: Merrill and Jerry Murphy, Steve and Nancy Attaway and Susan Wilson. Some stones were provided by the author, and others were obtained through commercial channels for comparison purposes. Special Thanks to Chris Krannenbert University of New Mexico Center of High Technology Materials for the use of the WYKO optical profiler and the Nikon Nomarski microscope. Thanks also to Sandia Systems, Inc. for the use of their video digitizer equipment. Optical fabricators often describe grinding or polishing as occurring in the "brittle" or ''ductile'' mode. In the brittle mode, material is removed quite rapidly. The removal mechanism is fracturing of material from the surface, leaving a rough-edged scratch. This mode typically occurs when the pressure on the stone surface near a sharp point (such as a particle of polishing or grinding compound) becomes high enough to cause the surface material to shatter locally. The chips then fly out as the pressure is removed. This process tends to leave deep micro-cracks and subsurface damage that must be polished out later, thus, the importance of working through the various grinding laps to a finer and finer grit before going to the polish stage. Caution should be exercised when using very coarse laps. In ductile mode, the material removal rate is much lower, and the removal mechanism is cutting rather than tearing. This mode tends to "polish" surfaces and may be able to slowly remove material from a surface without inducing serious amounts of additional surface and subsurface damage. It is possible to cause the hardness of the surface material to change by controlling the slurry chemistry and the electric fields near the surface. Studies have shown that it is possible to switch from brittle mode to ductile mode simply by altering the pH of the slurry. Clint Fruitman gave a nice talk on this subject at the 1994 Rocky Mountain Faceting Symposium held then in Tucson, Arizona. This notation was made for a few stones, where it was easy to see a gray haze on the gem surface when it was illuminated by a narrow, collimated, intense beam of light. In this case, the beam of light was provided by the WYKO optical profiler. The haze was caused by the scattering of light out of the beam by the surface roughness of the stone. It is possible to use this scattering of light to tell how smooth a stone is WITHOUT a microscope. Some people can detect roughness its low as one A by eye from just the scattering level. This might provide a qualitative means for faceters to judge the quality of the polish on a facet. In general, using a lap that is much harder than the stone being polished makes it easy to inadvertently get into the brittle mode of material removal during polishing. This usually makes it difficult to get a good polish, even though it is obvious that material is being removed. This is not always true, as it is somewhat material and chemistry dependent. This notation implies that there appears to be linear arrangements of surface pits on a facet after polishing is terminated. This typically occurs when insufficient material is removed during the pre-polish and polish stages to eliminate the deep pits and scratches produced during grinding, usually in brittle mode process. Again, it stresses the importance of working through the laps to a finer grit. Studies of optical finishing for technical optics have shown that, in general, one must remove material to a depth equal to around four to six times the diameter of the previous grit at each polishing step in order to remove the surface and sub-surface damage from the previous grinding step. For example, if one were about to use a pre-polish after a grinding step, where the grit particle size was five microns, then a layer of material around 20 to 35 microns deep should be pre-polished away before proceeding to the polishing step. One implication for gemcutting is that the use of large diameter grits, such as the 80-100 mesh early on to "rough in" a stone, may cause lots of grief later when the damage caused by rough grinding must be removed. It may be better to just take your time with a finer grit lap rather than to try and hurry it up with a coarser lap. The very coarse laps generate a deep damage layer, deeper that you might think possible. 23.7 Many sleeks evident. Appears to have nearly removed grinding damage. 8.0 Widely separated, deep long scratches. Very smooth between. Some possible handling damage. Background is very smooth. 28.2 Many well-defined scratches, mostly in one direction, with a weak background of scratches along another direction. Ductile regime scratches on lightly scratched background. 7.9 Quite a smooth, good surface. Occasional long, shallow scratches. Ductile scratches. Very smooth background. Many short, deep scratches, some sleeks. Visibly hazy in beam. Grinding damage not yet polished out. 21.1 Fair surface, occasional short, deep scratches, significant surface texture. Grinding damage polished out. Interesting surface texture with two dominant directions. 30.0 Many deep pits, more or less randomly oriented. Visibly hazy in bean. Grinding damage not yet polished out. 117.0 A first stone. Many deep pits, uniformly scattered. Grinding damage evident. Grinding damage not yet polished out. Some sleeks near pits. 7.8 Relatively smooth surface, occasional long shallow scratches. Faint background texture. Grinding damage fully polished out. Two predominant directions and texture. A good surface. 11.5 A first Stone. Good surface, occasional long shallow scratches. Grinding damage fully polished out. Faint bi-directional background texture. A good surface. 37.9 Sleeks, occasional tiny pits. Strong directional, variable scratches. Possible pre-polish damage not fully removed. 61.6 Surface appears to be uniformly micro-ground. Uniform, well-defined scratches all in one direction. Actual RMS levels should be higher due to aliasing in the WKYO. Well-defined, unidirectional, narrow scratches. Occasional pits, possibly due to agglomeration of polishing compound. 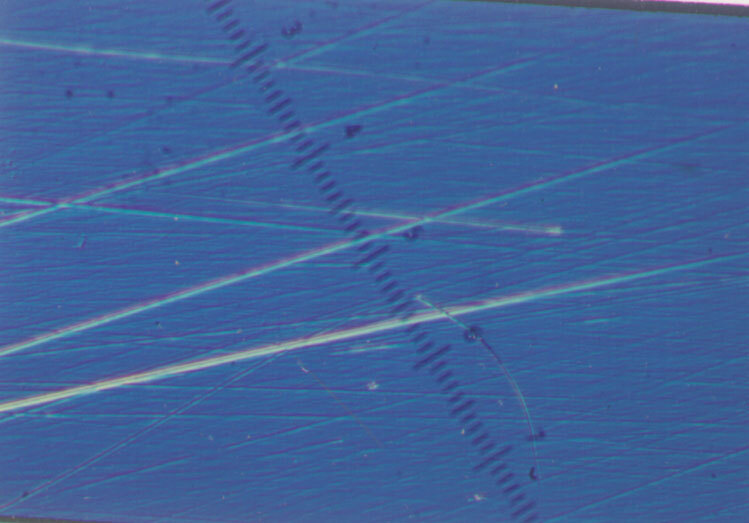 High magnification (500x) shows the scratches or smooth- walled, indicating ductal regime micro-grinding. 4.3 Nearly featureless surface. Faint, unidirectional background texture. No scratches or pits. Grinding damage fully polished out. A "typical" well-done Ultra lap surface. 69.8 Many scratches, some pits. Much grinding damage is evident. Grinding damage not yet removed. Barely polished at all. 20.2 Montana cutter. Many uniform, faint scratches. Almost no pits. Very consistent. Scratches in two directions only. Very similar to No. 16. Cutter probably used Ceramic lap. Grinding damage fully polished out. Many poorly defined scratches only in one direction. A good polish for sapphire. 53.5 Many unidirectional, faint scratches. Occasional pits, probable grinding damage. Some grinding damage evident. Unidirectional, well-defined scratches. Typical of a lap that is much harder than the material being polished. 24.6 Occasional deep scratches. Some pits, probable grinding damage. Grinding damage not yet polished out. Background suggested this would provide a nice polish if it were continued. 18.3 High quality surface. Very consistent. Very occasional shallow scratch or pit. An excellent polish, nearly featureless. Had to find a scratch in order to have something to focus on. Higher roughness numbers due to a long-range waviness on a scaled much larger than this photo. 13.50 Many random pits and scratches. Possible grinding damage. Unidirectional background texture. Grinding damage nearly polished out. Uniform, relatively strong background texture. 35.3 Many short, shallow unidirectional scratches. Frequent pits. Possible grinding damage. Similar to surface on No. 16. Grinding damage not yet polished out. Well-defined scratches typical of a lap much harder than the material being polished. 10.2 Nearly featureless. No visible background. Nearly featureless. Difficult to focus. Very faint background texture. Grinding damage fully polished out. An excellent polish. 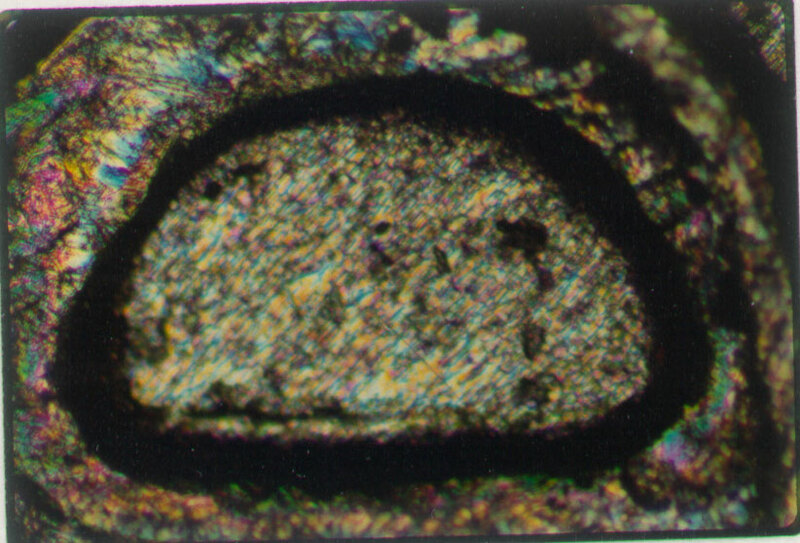 High magnification (500x) shows an orange peel surface with a shallow sub-micron diameter pits. 12.2 Nearly featureless. Faint background texture. Very consistent. Faint, you need directional background texture. Occasional pits, but not apparent grinding damage. Possibly handling damage. An excellent polish. 27.4 Many sharp-edged, more-or-less unidirectional scratches on smooth background. No pits. Very consistent. Grinding damage fully polish now. High magnification indicates that the polishing is occurring on the transition between ductal and brutal modes, thus, the sharp edge scratches. 5.2 Nearly featureless. Very rare small pit. Very consistent. An excellent polish. Difficult to focus. Occasional pits may be due to material imperfections. 24.1 Smooth background, no texture. Occasional small pit or scratch. Some sleeks. Probable grinding damage. Very smooth background. Pits and associates sleeks appear to be caused by contamination on the lap, probably grit from a previous grinding step. Grinding damage appears to be fully polished out. This could be a clean polished if kept clean. lost; around 10 Nearly featureless. Almost no background texture. Occasional small scratch. Very faint background texture. An excellent polish. All grinding damage has been polished out. 27 Photo for Camparision The inner portion of the letter D, standing for Denver Ment on a U.S. Quarter, taken at the same magnification as the gemstone photos.